The ruling gives Lee Boyd Malvo a sliver of hope that he might not die in prison for the Beltway sniper attacks in 2002. 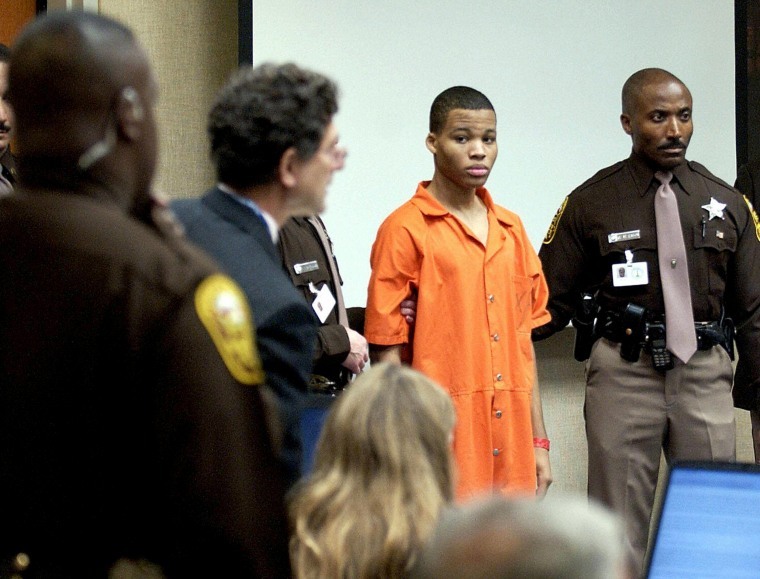 Lee Boyd Malvo, the younger of the two Beltway snipers who went on a killing spree in 2002 that left 10 people dead, got a gift Thursday from a federal appeals court in Virginia — a sliver of hope that he might not die in prison. In a 3-0 decision, the 4th U.S. Circuit Court of Appeals in Richmond ruled that the four life sentences that Malvo had been serving in Virginia must be vacated because the U.S. Supreme Court has ruled that mandatory life-without-parole sentences for juveniles are unconstitutional. Malvo was 17 when he and John Allen Muhammad fatally shot 10 people and wounded three more at random in Virginia, Maryland and Washington. Muhammad, who was 41 at the time of the spree, was executed in 2009. Malvo’s case will now sent back to a lower court for resentencing. The judge can still give him a life sentence if he or she decides that the convicted killer is “permanently incorrigible.” But if the judge decides that Malvo’s actions were affected by “the transient immaturity of youth,” he could get a lesser sentence. Charlotte Gomer, a spokeswoman for Virginia Attorney General Mark Herring, said he is considering his legal options, which include asking the U.S. Supreme Court to hear the Malvo case. “We are going to review the decision closely and decide how best to proceed in a way that ensures this convicted mass murderer faces justice for his heinous crimes," Gomer said. Bob Meyers, whose brother Dean was filling up at a gas station in northern Virginia when he was shot dead by Malvo, told The Associated Press that he was dismayed by the ruling. “Is it fair that he gets out when there certainly was a permanent sentence for his victims — not just one victim, but so many victims?” Meyers asked. In 2012, the Supreme Court struck down life sentences without parole for juveniles. Four years later, the justices said their ruling applied retroactively to cases on appeal. In May 2017, Judge Raymond Jackson of U.S. District Court in Virginia cited the two Supreme Court rulings in ordering a new sentencing for Malvo. Herring appealed to the 4th Circuit, which turned him down on Thursday. Malvo was also sentenced to life in prison for six murders in Maryland that were part of the original shooting spree, and Thursday’s ruling has no effect on them. He was denied a new sentencing hearing by a Maryland judge last August.